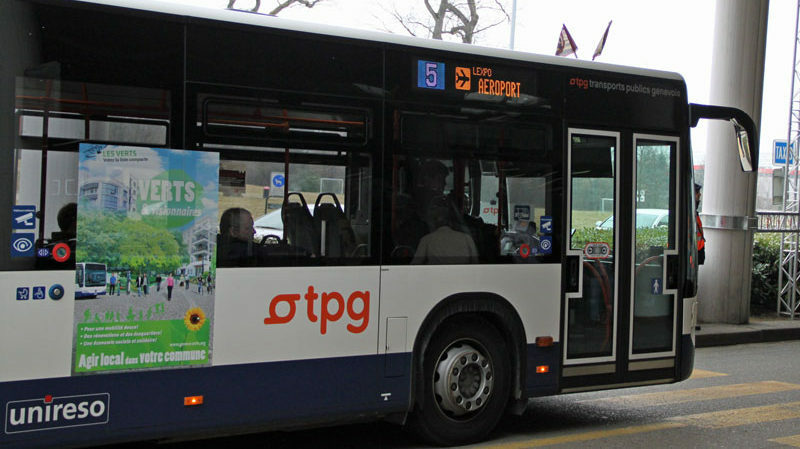 Public buses are the cheapest and often most convenient transportation to Geneva Airport (GVA) when traveling from downtown Genève and other suburbs. Getting to Geneva Airport (GVA) is often the cheapest and easiest on Genève’s public bus system. Buses run from the airport to downtown Genève Cornavin train station, the international organizations, and several suburbs of Geneva as well as nearby towns in France. The regular train is the fastest option if heading to Geneva’s main train station (also referred to as Genève-Cornavin station) or further into Switzerland. Taxis in Geneva are very expensive and surcharges are made for luggage. Compare prices and reserve online for private minibus airport transfers to any destination in Switzerland and France – for small groups the prices may be competitive with public transportation. Taxis to the airport are considerably cheaper than taxis from the airport. Taxi2Airport and Suntransfers give online quotations. Upon arrival at Geneva Airport, take a free Tout Genève ticket from the public transportation vending machine in the luggage claim area of the arrivals hall. It gives free travel on Geneva public transportation for 80 minutes. Bus 10 connects Geneva Airport and Rive in the old town via Balexert and Geneva train station – use the Lyon (Gare Cornavin) stop. Bus 5 connects Geneva Airport and Thônex-Vallard via Palexpo, Nations (International Organizations), Gare Cornavin, Bel Air, Hôpital, Muséum and Malagnou. Bus 28 connects Petit Lancy and the Botanical Gardens via Geneva Airport, Palexpo-Hall 7, the World Health Organization (WHO), United Nations (UN), Red Cross (ICRC), and the World Trade Organization (WTO), and Vernier. Bus 28 does not run to the station and old town but many options are available from Nations stop. Bus 57 connects Geneva Airport with Zimeysa and Vernier/Meyrin stations. All buses stop at the Swiss / International side of Geneva Airport near the railway station and never at the French sector. Gare Cornavin has excellent connections with Geneva’s public transportation buses and trams. Most buses and trams pass by the station. Many buses use stop Place 22 Cantons, which is a block to the west from the station stops. Walking and cycling to the airport are also possible but do consult maps in advance as finding the safe crossing points of the highway (Autoroute A1) is not all that easy.